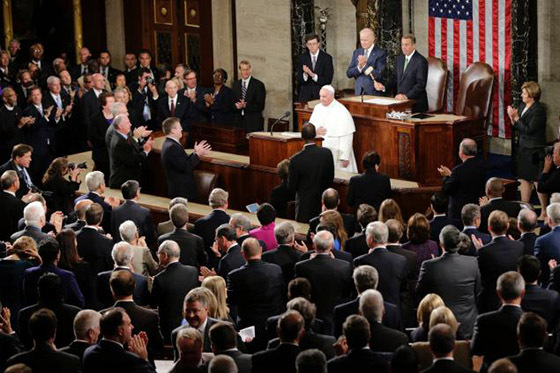 (From the published remarks of Pope Francis before the joint meeting of the United States Congress on Thursday, September 24. On abolishing the death penalty: "I am convinced that this way is the best, since every life is sacred, every human person is endowed with an inalienable dignity, and society can only benefit from the rehabilitation of those convicted of crimes. Recently my brother bishops here in the United States renewed their call for the abolition of the death penalty. Not only do I support them, but I also offer encouragement to all those who are convinced that a just and necessary punishment must never exclude the dimension of hope and the goal of rehabilitation." On Iran and Cuba: "When countries which have been at odds resume the path of dialogue- a dialogue which may have been interrupted for the most legitimate of reasons- new opportunities open up for all. This has required, and requires, courage and daring, which is not the same as irresponsibility. A good political leader is one who, with the interests of all in mind, seizes the moment in a spirit of openness and pragmatism. A good political leader always opts to initiate processes rather than possessing spaces." On the refugee crisis: "Our world is facing a refugee crisis of a magnitude not seen since the Second World War. This presents us with great challenges and many hard decisions. On this continent, too, thousands of persons are led to travel north in search of a better life for themselves and for their loved ones, in search of greater opportunities. Is this not what we want for our own children? We must not be taken aback by their numbers, but rather view them as persons, seeing their faces and listening to their stories, trying to respond as best we can to their situation." On immigration: "We, the people of this continent, are not fearful of foreigners, because most of us were once foreigners. I say this to you as the son of immigrants, knowing that so many of you are also descended from immigrants...Nonetheless, when the stranger in our midst appeals to us, we must not repeat the sins and the errors of the past. We must resolve now to live as nobly and as justly as possible, as we educate new generations not to turn their back on our 'neighbors' and everything around us. Building a nation calls us to recognize that we must constantly relate to others, rejecting a mindset of hostility in order to adopt one of reciprocal solidarity, in a constant effort to do our best. I am confident that we can do this." On poverty: "I would encourage you to keep in mind all those people around us who are trapped in a cycle of poverty. They too need to be given hope. The fight against poverty and hunger must be fought constantly and on many fronts, especially in its causes. I know that many Americans today, as in the past, are working to deal with this problem." On the arms trade: "Being at the service of dialogue and peace also means being truly determined to minimize and, in the long term, to end the many armed conflicts throughout our world. Here we have to ask ourselves: Why are deadly weapons being sold to those who plan to inflict untold suffering on individuals and society? Sadly, the answer, as we all know, is simply for money: money that is drenched in blood, often innocent blood. In the face of this shameful and culpable silence, it is our duty to confront the problem and to stop the arms trade." On religious fundamentalism: "We know that no religion is immune from forms of individual delusion or ideological extremism. This means that we must be especially attentive to every type of fundamentalism, whether religious or of any other kind. A delicate balance is required to combat violence perpetrated in the name of a religion, an ideology or an economic system, while also safeguarding religious freedom, intellectual freedom and individual freedoms. But there is another temptation which we must especially guard against: the simplistic reductionism which sees only good or evil; or, if you will, the righteous and sinners." "The Lord has redeemed all of us, all of us, with the Blood of Christ: all of us, not just Catholics. Everyone! 'Father, the atheists?' Even the atheists. Everyone! And this Blood makes us children of God of the first class! We are created children in the likeness of God and the Blood of Christ has redeemed us all! And we all have a duty to do good. And this commandment for everyone to do good, I think, is a beautiful path towards peace. If we, each doing our own part, if we do good to others, if we meet there, doing good, and we go slowly, gently, little by little, we will make that culture of encounter: we need that so much. We must meet one another doing good. 'But I don't believe, Father, I am an atheist!' But do good: we will meet one another there."